This May, celebrate International Migratory Bird Day! On May 10th, International Migratory Bird Day will aim to share the many ways that migratory birds matter to us and the earth. Blue-winged teal and other migrants feed in recently flooded field in Louisiana. Photo by John Pitre, NRCS. Each season, migratory birds travel long distances between breeding and non-breeding sites. Beyond providing recreational fun for bird lovers and wildlife gardeners, birds help to vegetate areas by dispersing seeds and pollinating flowering plants, trees and shrubs. The goal of International Migratory Bird Day is to motivate people of all ages and backgrounds to simply get outside and learn about native birds and what you can do to help protect them. It’s important to protect tropical forests where migratory birds overwinter, as well as the important breeding grounds in Canada’s boreal forest, but there are things that you can do closer to home to help migratory birds, whether they’re species that are just passing through or those that end their migration in your neighborhood. When trying to attract birds to your garden at home, there are a variety of measures you can take. Consider the different things birds need to survive: food, water, cover, and a safe place to construct a nest. Begin with water – a simple birdbath is a great place to start. Keep the birdbath about 10 feet away from dense shrub or other areas that may attract predators to keep the birds safe from harm. Also make sure to change the water every 2-3 days in the summer and use a heater in the winter. 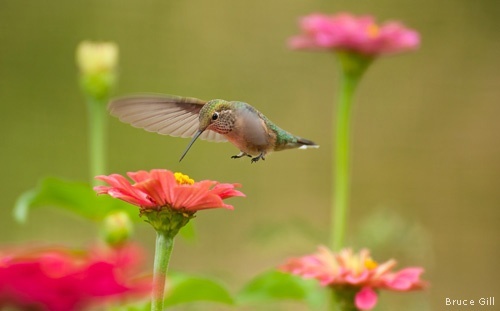 Broad-tailed hummingbird feeding on zinnia. Photo by Bruce Gill. To provide food sources to birds, install native plants to offer seeds, berries, nuts, and nectar. Think about recreating the plant ecosystem of your local area. This will also attract insects, a primary source of protein for birds. Bird feeders also provide supplemental food during times of scarcity. Birds will build nests out of almost anything they can find. Building a brush pile in a corner of your yard can provide materials for birds to make nests. Keeping dead trees around your garden can offer cavity-dwelling places for birds to raise young. You can also put out nesting boxes, but make sure they have ventilation holes at the top and drainage holes near the bottom. Once you’ve provided, food, water, cover, and a safe place for birds to raise their young, you’ll be ready to certify your wildlife garden in time for International Migratory Bird Day. To find International Migratory Bird Day happenings in your area, check out the IMBD Events Map. And just because it’s being celebrated on May 10 doesn’t mean you can’t celebrate birds and the outdoors every day! Celebrate Garden for Wildlife Month by becoming a Wildlife Gardener with National Wildlife Federation. It’s free and you’ll get great wildlife gardening tips and learn how to certify your garden as an official habitat.